The author is the crop preparation marketing manager for New Holland Agriculture. Forage that was once judged by appearance and smell can now be quantified by numbers. The current laundry list of forage quality metrics not only helps us to define and explain forage value, but it also leads us to more informed harvest and feeding decisions. Modern laboratory methods allow us to put numbers to what was once subjective, providing a measuring stick that can be used to quantify continuous improvement. There is never any higher forage quality than when a crop is standing. Once cut, the challenge for haymakers is preserving the quality they have. With that in mind, here are a few field-proven cutting tips to help you produce the highest forage quality possible. Forage ash content influences quality. Ash encompasses the minerals of the plant, both internal and external. Some (calcium and magnesium, for example) may be beneficial, while others associated with soils (silica) are detrimental. Good or bad, both internal and external sources contribute to total ash content. When it comes to influencing quality, limiting external ash is essential. When haymakers talk about productivity, the mantra is almost always faster. Greater speed is a logical way to harvest more acres per hour, and it’s also a basic point of comparison between sickle and disc cutting. Disc cutting offers the clear advantage here, and the rhythmic sickle sound continues to fall silent in fields across the country. But with disc cutting speed comes rotating discs that create strong air movements. 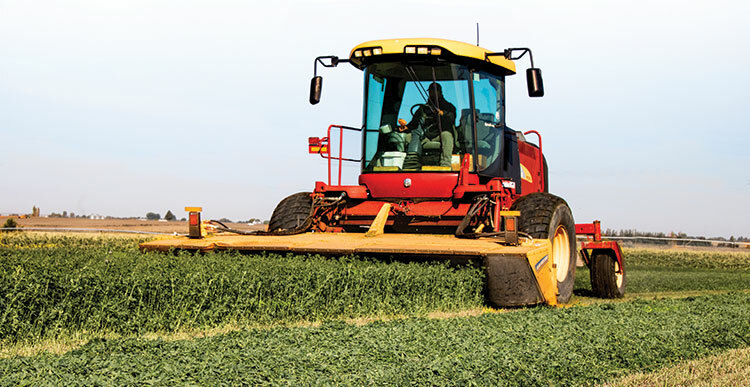 The tendency to cut alfalfa low for maximum yield means strong air movement near to the ground where dust is easily kicked up, raising detrimental forage ash levels. This may be aggravated by a steep knife twist that can lift light soil particles. Raise the cutting height. The trade-off in cutting height is harvested yield. Low cutting boosts the tons per acre harvested. On the other hand, cutting higher can improve quality by lowering ash content. Some recent studies have also suggested that cutting higher drives quality by leaving more of the fibrous, less-digestible stems behind. Dan Undersander, retired extension agronomist with the University of Wisconsin, also recommends higher cutting because the resulting crop stubble may hold the mown crop up and away from the soil. This reduces ash content while helping to speed up drying. In light crops, slow the disc speed. Not every cut is like the first crop. 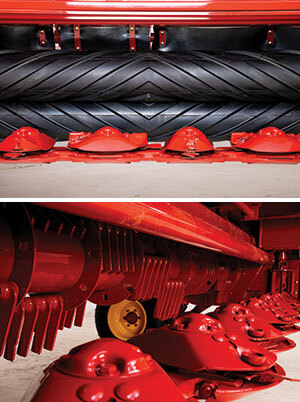 Heavy crops may demand full disc speed. However, in lighter, late-season crops, extremely dry conditions, or where new stands are not well established, high disc speeds may be a disadvantage. Excessive air movement may produce an unfavorable cut quality. It can also kick-up dirt and dust, which deposits on the mown crop, raising the ash content. Choose a shallow-angle knife. Knife designs vary across the industry from flat to 18-degree twist knives. With all of the knife choices available today, it can be a bit confusing. A basic rule is that a shallower angle knife produces less suction. That means less soil disturbance and a lower forage ash content, especially when conditions are dry and the soil is easily disturbed. These days, choosing an alternative knife is faster and easier thanks to the advent of quick-change knife technology offered on many of the new disc mowers. The greatest quality risk faced by producers is also the most difficult to control — weather. The best way to maintain quality is getting the crop off before unfavorable weather occurs. An understanding of the crop drying phases may help producers appreciate why proper conditioning is so important. Leaf pores, known as stoma, allow gas and moisture to exchange with the air. In the early phases of forage dry down, moisture rapidly escapes through the stomatal openings; mechanical forage conditioning will have little initial benefit immediately after cutting. During the early drying phases, exposure to sunlight will stimulate stomata to remain open. 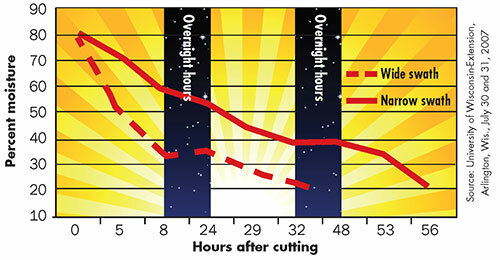 Wide swaths expose more stomata to sunlight; this not only speeds drying, but also results in plants retaining a higher concentration of plant sugars for improved forage quality. Field trials in Wisconsin showed wide swaths dried significantly faster (see graph)and relative forage quality (RFQ) was 11 points higher for the wide swaths compared to the narrow swaths. The real benefit of mechanical conditioning comes after the initial drying phase when reduced plant moisture shuts down physiological processes and prevents stomatal opening. Plants, by their nature, are designed to keep moisture inside. Without conditioning, moisture essentially becomes trapped. Mechanical conditioning creates artificial openings by cracking and crimping stems or by scraping the waxy cuticle layer to free trapped moisture. Generally speaking, forage conditioners are a beneficial option unless all the hay being harvested is done at high-moisture levels. If your mother was anything like mine, then you’ve heard the expression, “Too much of a good thing isn’t good for you.” That’s especially true when it comes to forage conditioning. There’s a line between proper conditioning and over conditioning. Let’s look at the basic systems. Flail-tine and impellor systems: For a grass hay producer, these systems are effective tools that strip away the waxy cuticle layer. While it is possible to make alfalfa hay with an impellor or a flail-tine system, many studies have shown field losses are considerably higher than roll-type systems. When harvesting alfalfa for haylage with a flail-tine system, it’s imperative to slow the rotor speed and raise the conditioning hood clearance. This reduces conditioning intensity and conserves leaves. However, it will slow crop drying in the later drying phases, which can be counterproductive when making dry hay. Roll systems: These systems offer producers the flexibility to effectively condition grass, alfalfa, and even more difficult cane crops. Roll conditioning systems, both rubber and steel, have a few basic adjustments that can impact drying time and forage quality. Roll gap — The vertical clearance between the rollers. Roll timing — The horizontal clearance between the roll lugs. Roll pressure — The resistance to separation or the pressure applied. When harvesting alfalfa, roll conditioners (above) are the system of choice over flail conditioners (below). Rubber or steel, roll gap may be the most important adjustment of a roll conditioner. If the clearance is too great, the crop may pass through without being conditioned. If it’s too narrow, thick-stemmed crops may not pass through. Adjusting the clearance is essential to effective conditioning and machine performance. This will help to ensure stem crimping and crushing and fast crop drying, while still preserving leaves. Roll timing is the most often overlooked factor and is only slightly less important than gap. If you’ve ever adjusted gear lash then you know the importance of getting it right. Ensuring the lugs and the valleys are centered relative to each other and maintaining equal clearance is critical. If the lugs are too close (or, worse, if they are touching) field losses will mount as crop stems become overconditioned and leaves detach. Beyond forage quality, improper timing will raise the machine load and fuel consumption, causing premature roll wear. Roll pressure, or tension, is the go-to first adjustment for most producers. Often, it’s the easiest conditioning adjustment to make on a mower-conditioner. Before adjusting pressure, however, first consider exactly what that element of the system does. Roll pressure is explained as the resistance to the rolls opening or separating as the crop mat passes between and pushes them apart. In general, a light crop means there isn’t much need to squeeze, so back the setting down. The opposite is true in heavy crops. When there is a thick crop mat, a higher setting can speed drying. There are many factors that impact forage quality, some more easily controlled than others. Choosing the proper machine type and ensuring it is properly adjusted are controllable factors that potentially can have a significant impact on forage quality. This article appeared in the January 2019 issue of Grower on pages 12 and 13.